Published By – Rockstar Games, Inc. Published By – Beyond Science, Inc. Published By – Spirit Two Music Inc. Contains excerpts from "Jigsaw Puzzle" by Blue Effect courtesy of Radim Hladik o/b/o Blue Effect. Used by permission. All rights reserved. Aloe Blacc appears courtesy of Interscope Records, a division of UMG Recordings, Inc. Contains recorded performances under license from Interscope Records, a division of UMG Recordings. 5. Published by Reservoir Media Management, Inc., A Maman Music [administered by The Royalty Network, Inc.][ASCAP], Rockstar games, Inc.
Phantogram appears courtesy of Republic Records, a division of UMG Recordings, Inc.
A$AP Ferg appears courtesy of Polo Grounds Music/RCA Records, a division of Sony Music Entertainment. Contains excerpts from "California," performed by Ariel Pink and Dam-Funk and written by Monika James. Used by permission from 4AD Records, Stones Throw Records and Spirit Two Music Inc. All rights reserved. Kobalt Music Publishing America, Inc., Rockstar Games, Inc.
Danny Brown appears courtesy of Fool's Gold, Inc. Sample clearances by DMG Clearances, Inc.
P & C 2015 Rockstar Games exclusively distributed by Mass Appeal Records. ©2015 Rockstar Games, Inc. Rockstar Games, Grand Theft Auto, the GTA Five, and the Rockstar Games [logo] marks and logos are trademarks and/or registered trademarks of Take-Two Interactive Software, Inc. in the U.S.A. and/or foreign countries. All other marks and trademarks are properties of their respective owners. 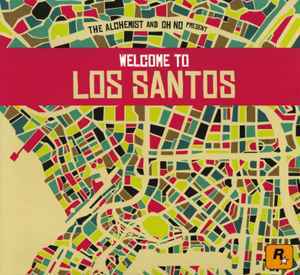 Inspired by the soundtrack to Grand Theft Auto V.
Issued in a three-panel cardboard sleeve.